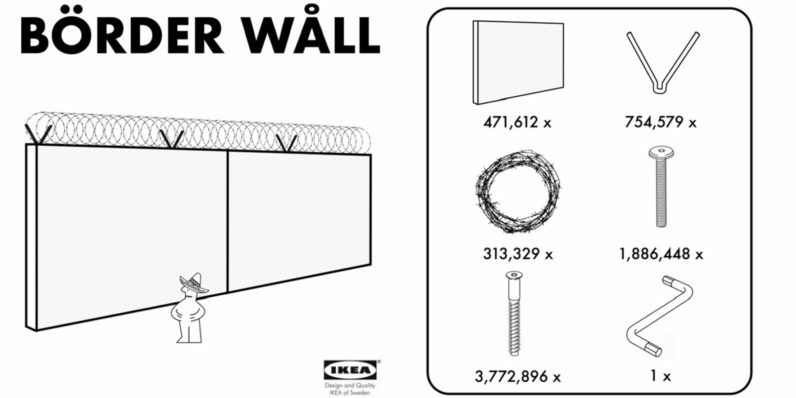 IKEA, the company known for their rage-inducing assembly instructions, might have the perfect solution to Trump’s border wall. It’s affordable, it’s easy to get, and it only takes two people — or so this satirical ad would have you believe. “Börder Wåll,” a faux IKEA product ad, could save President Trump some change. Unlike Trump’s wall, this one will set back taxpayers just $10 billion, as opposed to the $15- to-$25 billion the project could cost. We have the German “honest news” site Der Postillon to thank for the ad. In it, we see a graphic of just what you would get in every package, along with an individual in a dashing sombrero looking up at the wall in awe. If that sounds a little too intimidating, then don’t worry! The Börder Wåll would come with a 5-year guarantee and a 12,000-page instruction manual. Der Postillon says it’s available at any IKEA branch, although presumably the President will want one heck of a roof rack to transport it. It’s a pity this incredible deal isn’t actually legitimate! We would all enjoy seeing the President patriotically twisting the hex key into the first screw, presumably while Vice President Pence holds the panel aloft!